The first step in using Lighthouse is establishing a Slurm account. Lighthouse users must be authorized by the PI or a user authorized to make changes to the account. Contact HPC support to request user changes. 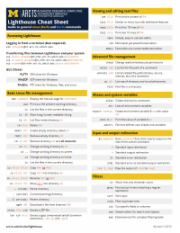 See the Lighthouse cheat sheet for a list of common Linux (Bash) and Slurm commands, including Torque and Slurm comparisons. Go to Lighthouse Overview TO SEARCH THIS USER GUIDE, USE THE COMMAND + F (MAC) OR CTRL + F (WIN) KEYBOARD SHORTCUTS. You must use Duo authentication to log on to Lighthouse. Get more details on the Safe Computing Two-Factor page and enroll here. You must establish a user login on Lighthouse by filling out this form. Download and install PuTTY here. Launch PuTTY and enter lighthouse.arc-ts.umich.edu as the host name, then click open. At the “Enter a passcode or select one of the following options:” prompt, type the number of your preferred choice for Duo authentication. You can use SFTP (best for simple transfers of small files) or Globus (best for large files or a commonly used endpoint) to transfer data to your /home directory. On Windows, you can also use WinSCP with similar settings, available alongside PuTTY here. You will need to authenticate via Duo to complete the file transfer. Globus is a reliable high performance parallel file transfer service provided by many HPC sites around the world. It enables easy transfer of files from one system to another, as long as they are Globus endpoints. The Globus endpoint for Lighthouse is “umich#lighthouse”. Globus Online is a web front end to the Globus transfer service. Globus Online accounts are free and you can create an account with your University identity. Set up your Globus account and learn how to transfer files using the Globus documentation. Select “University of Michigan” from the dropdown box to get started. 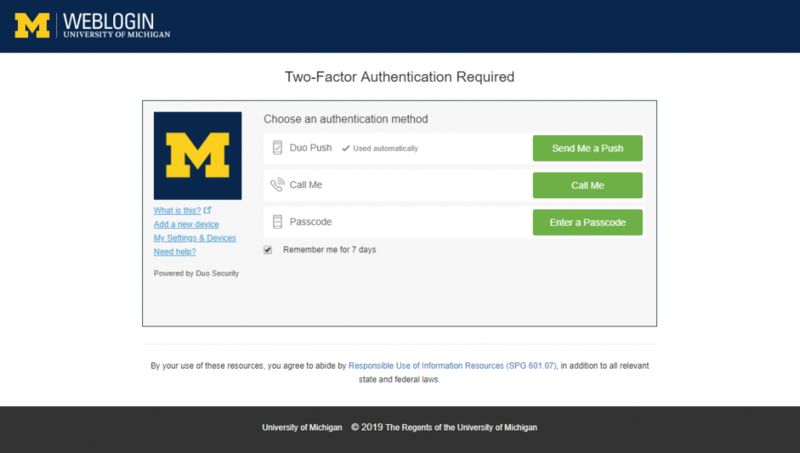 Once you are ready to transfer files, enter “umich#lighthouse” as one of your endpoints. Globus Online also allows for simple installation of a Globus endpoint for Windows, Mac, and Linux desktops and laptops. Follow the Globus instructions to download the Globus Connect Personal installer and set up an endpoint on your desktop or laptop. A non-standard use of Globus Online is that you can use it to copy files from one location to another on the same cluster. To do this use the same endpoint (umich#lighthouse as an example) for both the sending and receiving machines. Setup the transfer and Globus will make sure the rest happens. The service will email you when the copy is finished. There are Command line tools for Globus that are intended for advanced users. If you wish to use these, contact HPC support. This is a simple guide to get your jobs up and running. For more advanced Slurm features, see the Slurm User Guide for Lighthouse. If you are familiar with using the resource manager Torque, you may find the migrating from Torque to Slurm guide useful. On Lighthouse, like the Flux Operating Environment, you can run on hosts owned by a researcher who has granted you access. Unless the researcher has placed additional limits, the only default limit is a 2-week maximum runtime (wallclock). You will submit your jobs to a partition (queue) named after the PI’s uniqname. To help in the transition, we have included 2 test nodes in your partition. These 2 test nodes are shared with all FOE/Lighthouse researchers, so availability will depend on current demand. This is similar to the environment you previously tested on the Beta cluster (there is a short limit on run times for jobs). You can submit jobs to that partition to validate your workflows. Once the PI has moved their nodes from FOE to Lighthouse, the test nodes will be removed from the PI’s partition and the maximum runtime will be set to 2 weeks. Most work will be queued to be run on Lighthouse and is described through a batch script. The sbatch command is used to submit a batch script to Slurm. To submit a batch script simply run the following from a shared file system; those include your home directory, /scratch, and any directory under /nfs that you can normally use in a job on Flux. Output will be sent to this working directory (jobName-jobID.log). Do not submit jobs from /tmp or any of its subdirectories. This is the simplest case and is shown in the example above. The majority of software cannot use more than this. Some examples of software for which this would be the right configuration are SAS, Stata, R, many Python programs, most Perl programs. This is similar to what a modern desktop or laptop is likely to have. Software that can use more than one processor may be described as multicore, multiprocessor, or multithreaded. Some examples of software that can benefit from this are MATLAB and Stata/MP. You should read the documentation for your software to see if this is one of its capabilities. This is the classic MPI approach, where multiple machines are requested, one process per processor on each node is started using MPI. This is the way most MPI-enabled software is written to work. This is often referred to as the “hybrid mode” MPI approach, where multiple machines are requested and multiple processes are requested. MPI will start a parent process or processes on each node, and those in turn will be able to use more than one processor for threaded calculations. Please note that if your job is set to utilize more than one node, make sure your code is MPI enabled in order to run across these nodes and you must use srun rather then mpirun or mpiexec. More advanced job submission options can be found in the Slurm User Guide for Lighthouse. If you need to actively interact to complete a task, you can submit an interactive job. When your interactive job runs, you will have command line access (instead of running a script) on a compute node and can interact with all of the resources you requested. Interactive jobs are useful when debugging or interacting with an application. The srun command is used to submit an interactive job to Slurm. When the job starts, a command line prompt will appear on one of the compute nodes assigned to the job. From here commands can be executed using the resources allocated on the local node. In the above example srun is used within the job from the first compute node to run a command once for every task in the job on the assigned resources. srun can be used to run on a subset of the resources assigned to the job. See the srun man page for more details. You can see the status of a job with `squeue -j <jobID>` . Most of a job’s specifications can be seen by invoking scontrol show job <jobID>. More details about the job can be written to a file by using scontrol write batch_script <jobID> output.txt. If no output file is specified, the script will be written to slurm<jobID>.sh. A job’s record remains in Slurm’s memory for 30 minutes after it completes. scontrol show job will return “Invalid job id specified” for a job that completed more than 30 minutes ago. At that point, one must invoke the sacct command to retrieve the job’s record from the Slurm database. For more reporting options, see the Slurm sreport documentation. You must use Duo authentication to log on to the Lighthouse OnDemand web service. Get more details on the Safe Computing Two-Factor page and enroll here. You should now be logged in. “From Default Template”: Uses system defaults for a bare bones “Hello World” job on the Lighthouse cluster. Please note that you will still need to specify your account. “From Specified Path”: Creates a job from a specified job script. See the Slurm User Guide for Lighthouse for information on writing this script. Some attributes (name, account) can be set here if not set in the script. “From Selected Job”: Creates a new job that is a copy of the selected job. “Edit Files”: Opens a the project folder in a new File Explorer tab, allowing you to edit the files within (see “Get Files” above for File Explorer instructions). 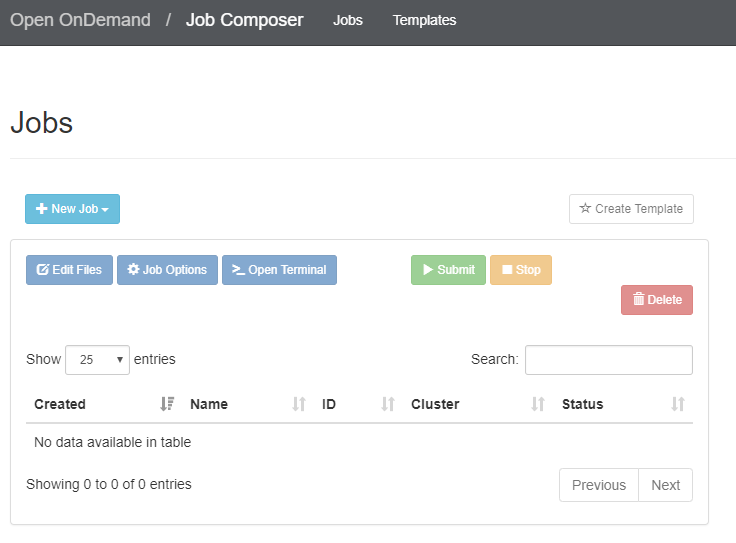 “Job Options”: Allows for editing the Name, Cluster, Job Script, and Account fields. “Open Terminal”: Opens a terminal session in a new tab, starting in the project folder. “Submit”: Submits the selected job to the cluster. “Stop”: Stops the selected job if it has been submitted. “Delete”: Delete the selected job. To view active job information, click “Jobs” and then “Active Jobs” from the home page. This is a simple guide to get your jobs up and running. For more advanced Slurm features and job scripting information, see the Slurm User Guide for Lighthouse. If you are familiar with using the resource manager Torque, you may find the migrating from Torque to Slurm guide useful. At the top of the home page, click “Interactive Apps” and then select your desired application. A remote desktop session will then be opened in a new tab for the requested amount of time. If you finish early, return to the “My Interactive Sessions” tab and delete the job. 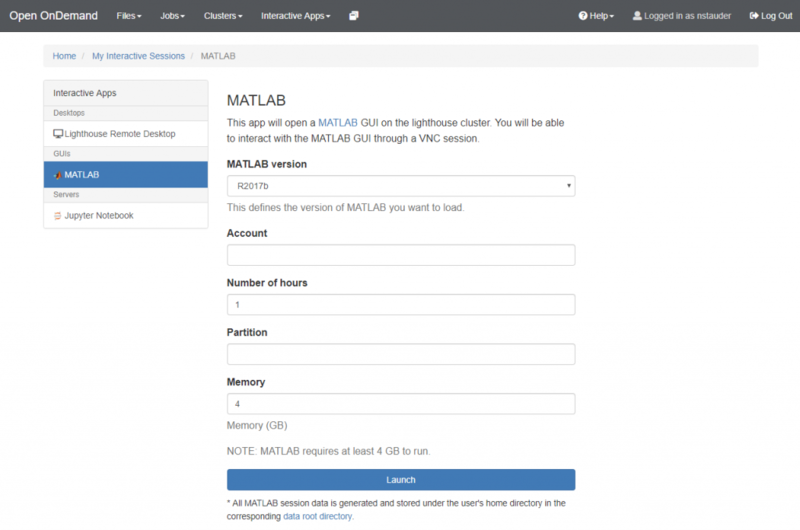 A remote desktop session running MATLAB will then be opened in a new tab for the requested amount of time. You may also use the terminal and other basic applications. If you finish early, return to the “My Interactive Sessions” tab and delete the job. 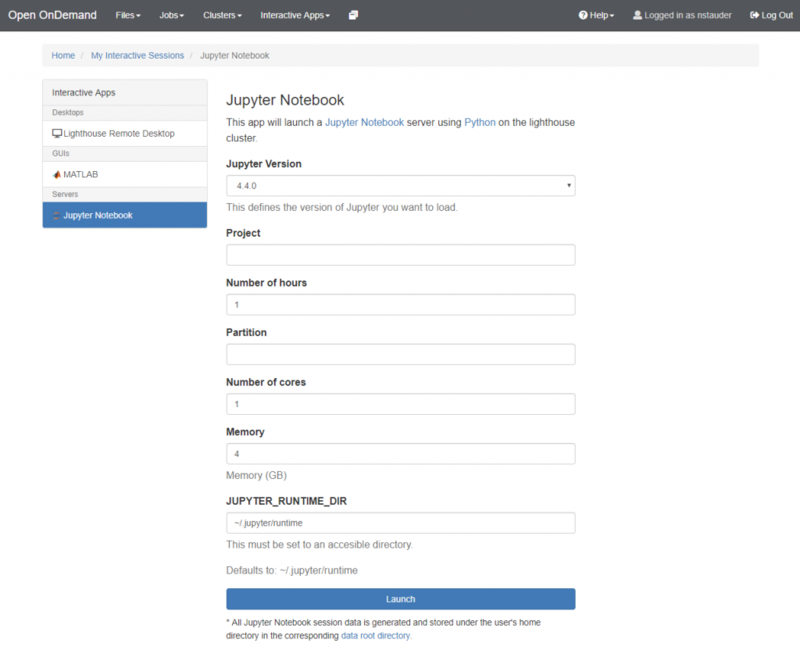 For instructions on using Jupyter Notebook, see the official documentation. 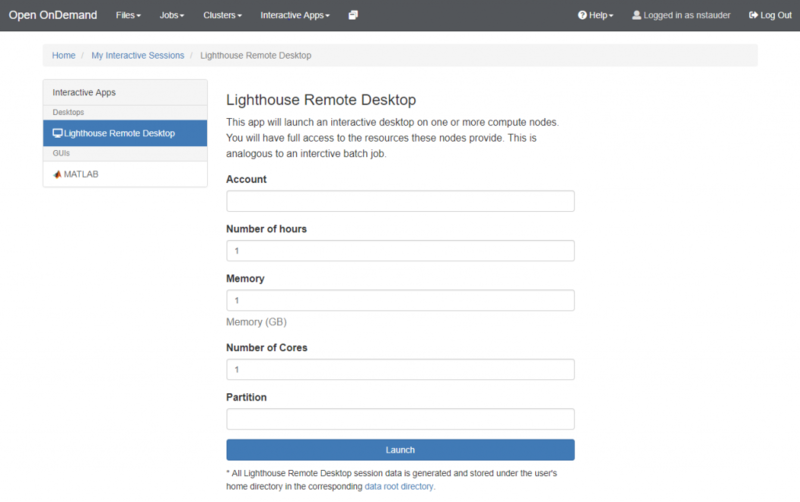 The Lighthouse cluster uses the Lmod modules system to provide access to centrally installed software. If you used a cluster at UM previously, then you should review the documentation for the module system as we have changed the configuration to match that used at most national clusters and most other university clusters. In particular, you should use the command module keyword to look for a module and do not use module available to search for software, as module available will only show software for which all the dependencies (or prerequisites) are already loaded. That will show which versions are installed and provide a command to determine what is needed to load it. Please see our page on using the Lmod modules system for more details and examples. There are two main categories of software available on the system: software that is installed as part of the installation of the operating system and software that is installed separately. No special action is needed to use the software installed with the operating system. The separately installed software is set up so that you will use a module to use it. The module will set up the environment and make the software available. We do it this way to enable having multiple versions of the same package and to avoid having conflicts between software packages that have mutually exclusive system requirements. Slurm partitions represent collections of nodes, and are equivalent to Torque queues. Each PI’s standard compute nodes are identified by the PI’s uniqname and have a maximum job walltime of 14 days (can be increased up to 4 weeks at the PI’s request). During the transition from FOE to Lighthouse, each partition will include two test nodes prior to the migration of the PI’s nodes into Lighthouse for testing. Slurm associations are a combination of cluster, account, user names and optionally a partition. An association can have limits (e.g. account ‘testaccount’ using partition ‘msbritt’ on cluster ‘lighthouse’ has a running job limit of X). TRES (Trackable Resources) are resources which can be tracked for usage or used to enforce limits. Common examples include CPU, memory, and GRES for GPUs. Limits can be set on the user association as well as the account association. This allows a PI to limit individual users or the collective set of users in an account as the PI sees fit. Please contact ARC-TS if you would like to implement any of these limits. Data is not backed up. None of the data on Lighthouse is backed up. The data that you keep in your home directory, /tmp or any other filesystem is exposed to immediate and permanent loss at all times. You are responsible for mitigating your own risk. ARC-TS provides more durable storage on Turbo, Locker, and Data Den. For more information on these, look here. Your usage is tracked and may be used for reports. We track a lot of job data and store it for a long time. We use this data to generate usage reports and look at patterns and trends. We may report this data, including your individual data, to your adviser, department head, dean, or other administrator or supervisor. Maintaining the overall stability of the system is paramount to us. While we make every effort to ensure that every job completes with the most efficient and accurate way possible, the stability of the cluster is our primary concern. This may affect you, but mostly we hope it benefits you. System availability is based on our best efforts. We are staffed to provide support during normal business hours. We try very hard to provide support as broadly as possible, but cannot guarantee support on a 24 hours a day basis. Additionally, we perform system maintenance on a periodic basis, driven by the availability of software updates, staffing availability, and input from the user community. We do our best to schedule around your needs, but there will be times when the system is unavailable. For scheduled outages, we will announce them at least one month in advance on the ARC-TS home page; for unscheduled outages we will announce them as quickly as we can with as much detail as we have on that same page. You can also track ARC-TS on Twitter (@ARC-TS ). Lighthouse is intended only for non-commercial, academic research and instruction. Commercial use of some of the software on Lighthouse is prohibited by software licensing terms. Prohibited uses include product development or validation, any service for which a fee is charged, and, in some cases, research involving proprietary data that will not be made available publicly. Please contact hpc-support@umich.edu if you have any questions about this policy, or about whether your work may violate these terms. You are responsible for the security of sensitive codes and data. If you will be storing export-controlled or other sensitive or secure software, libraries, or data on the cluster, it is your responsibility that is is secured to the standards set by the most restrictive governing rules. We cannot reasonably monitor everything that is installed on the cluster, and cannot be responsible for it, leaving the responsibility with you, the end user. Data subject to HIPAA regulations may not be stored or processed on the cluster. For questions about Protected Health Information (PHI), contact Michigan Medicine Corporate Compliance at compliance-Group@med.umich.edu. Scratch directories are slightly different than as implemented on Flux. The goal is to simplify data use while still giving flexibility for data sharing for researchers with multiple groups working for them that should not be able to share/see data. An initial /scratch directory is created for each Slurm account, with its name and group-ownership based on the Slurm account/UNIX group name (e.g. /scratch/msbritt with UNIX group-owner msbritt). Additional Slurm accounts (e.g. msbritt1) have the option in the order form to create a new /scratch directory if needed (/scratch/msbritt1). This new /scratch/msbritt1 will be owned by the initial UNIX group (msbritt), unless the PI requests a new UNIX group (msbritt1). ARC-TS generates /scratch/msbritt/<uniqname>/ directories for every member of the UNIX group “msbritt” with the group ownership set accordingly (e.g. “msbritt”). Users may use /scratch with no set quota and with an auto-purge policy on unaccessed files over 60 days. Scratch file systems are not backed up. Critical files should be backed up to another location. 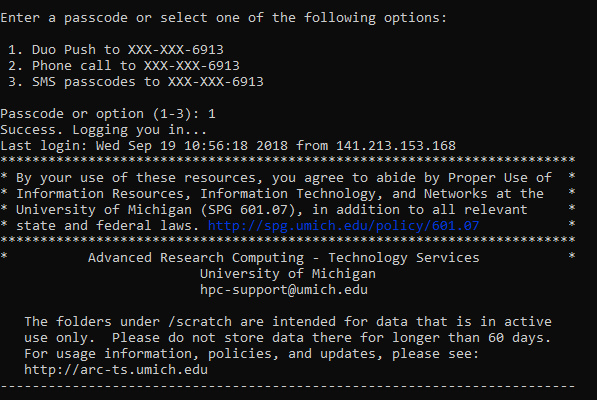 The Lighthouse high-performance computing system at the University of Michigan has the same security stance as the Great Lakes cluster. Secure access – All access to Lighthouse is via SSH or Globus. SSH has a long history of high-security. Built-in firewalls – All of the Lighthouse computers have firewalls that restrict access to only what is needed. 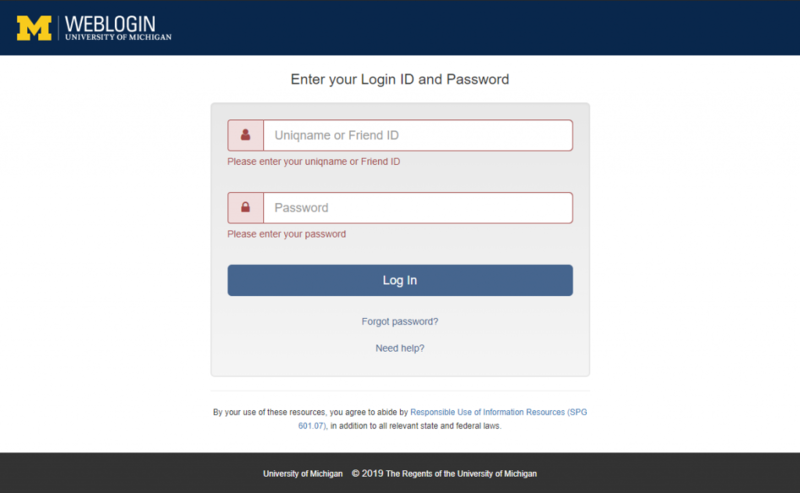 Unique users – Lighthouse adheres to the University guideline of one person per login ID and one login ID per person. Multi-factor authentication (MFA) – For all interactive sessions, Lighthouse requires both a UM Kerberos password and Duo authentication. File transfer sessions require a Kerberos password. 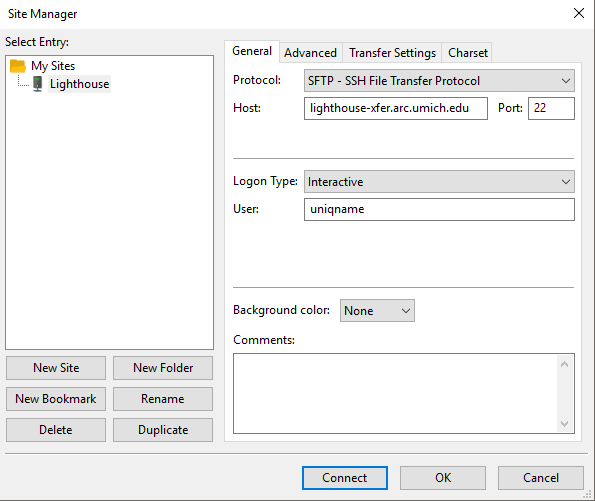 Private Subnets – Other than the login and file transfer computers that are part of Lighthouse, all of the computers are on a network that is private within the University network and are unreachable from the Internet. Flexible data storage – Researchers can control the security of their own data storage by securing their storage as they require and having it mounted via NFSv3 or NFSv4 on Lighthouse. Another option is to make use of Lighthouse’s local scratch storage, which is considered secure for many types of data. Note: Lighthouse is not considered secure for data covered by HIPAA. This section will be updated when system level changes are made to Lighthouse. There are currently no updates.